The Marché de Noël à Montreux is by far the largest and best Christmas market to visit in the Lake Geneva (Lac Léman) region of Switzerland. Apart from the Weihnachtsmarkt, Santa’s workshop, a Christmas village, and medieval festival await advent visitors. In 2018 the Montreux Christmas Market is open from November 22 to December 24, 2018. The best Christmas market in French-speaking Switzerland, and one of the largest in the country, is the Marché de Noël à Montreux. Each December, around 160 market stalls sells Christmas fares at the traditional Christmas market (Weihnachtsmarkt) in town and on the lake-side quays, at the special market for a guest country, and the covered market in Montreux. Further holiday cheer is added by a medieval festival at Chateau de Chillon Castle, a Christmas village in Caux near Montreux, and Santa’s workshop at the top of Rocher-de-Naye, an Alpine peak with wonderful views of Lake Geneva and the mountains. The Village des Lutins in the gardens of the Casino shows the elves at work. A new addition from 2017 is a special 3D light show display on the facade of the famous Fairmont le Montreux Palace Hotel. In 2018, the Montreux Christmas market is open from November 22 to December 24, 2018. Opening hours are generally 11 am to 8 pm (10 pm on Thursday, Friday, and Saturday) with food stalls often staying open an hour later. On weekends, the market opens at 10 am. The annual Christmas market in Montreux is the largest and best Marché de Noël to visit in western Switzerland. It comes closer to a proper German Weihnachtsmarkt than any other market in the region although the Montreux Christmas market remains distinctly French-Swiss in presentation, atmosphere, wares, and food on sale. Wine and good food are important. The main Christmas market in Montreux consists of around 160 stalls and chalets on the quays of Lake Geneva, the covered market (Marché Couvert), and in Grand Rue. These sell anything from antiques (Brocante de Noël) to arts and crafts. Jewelry and clothes are common as are household and Christmas decorations. The best food is available from the Village des Bûcherons area where several restaurants serve a variety of menus. 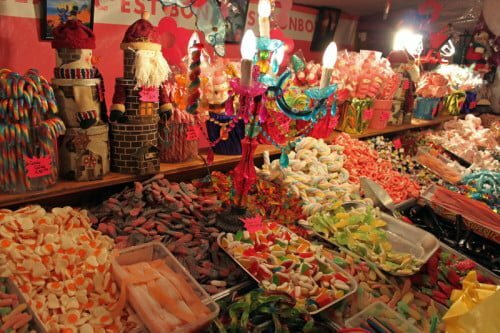 However, traditional Christmas market food is sold at many stall scattered throughout the market. Vin chaud (mulled wine / Glühwein), chestnuts, crepes and chocolates are particularly popular. In contrast to German Christmas market custom, mulled wine is sold in disposable plastic cups but Montreux souvenir mugs are available from a few stands. Each year, a guest country is invited to share its Christmas traditions at the Montreux Marché de Noël. The guest country stalls are set up near the covered market and the Freddy Mercury statue. 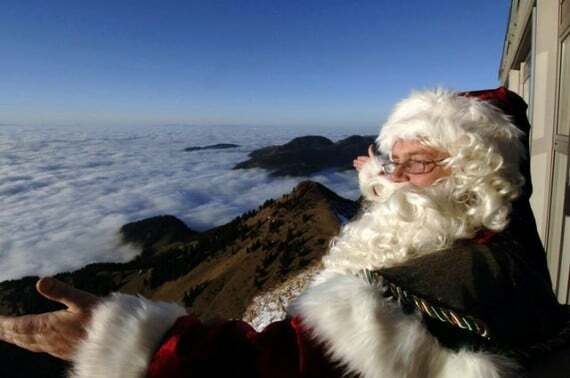 In 2018, Bosnia and Herzegovina will be the guest nation at the Montreux Christmas market. Children and families enjoy the various family-friendly stalls and play areas at the Christmas market in Montreux. In the upper floor of the covered market, children can color their own candles or bake Christmas cookies. The Village des Lutins (Elves Village) is a special section aimed at families with smaller children where it is possible to buy and participate in making gifts. Chateau de Chillon Castle near Montreux is a great destination for children and adults of any age. Chillon claims to be the most popular castle in Switzerland – it is a great place to visit at any time of the year. However, during advent weekends, a special medieval market and festival is held at the castle. The festival involves medieval food, music, arts, and technology – the main themes covered differ each weekend. 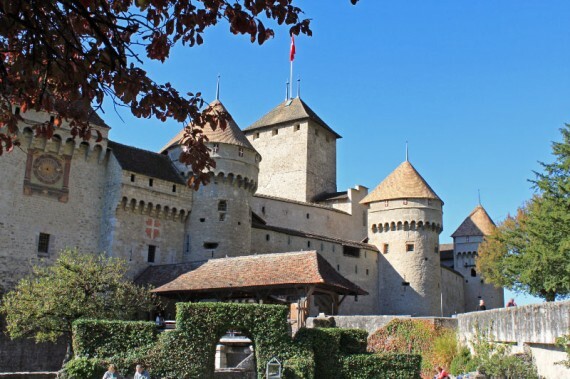 The Chateau de Chillon Marché Médiéval Festival de Conte is held at the castle most advent weekends from 2 to 5 pm. Admission to the castle and fair is around CHF15 – child fares and family discount tickets available. A popular outing for families with children is the Christmas village with magic forest at Caux and Santa’s workshop at the top of Rocher-de-Naye alpine peak. These sights are best reached by MOB Golden Pass train. The Christmas village is set up in the gardens of the Chateau de Caux in the mountains above Montreux. During the Montreux Christmas market period, the village is open Wednesdays to Sundays from 11 am to 7 pm. Caux is best reached by train, as parking in Caux is very limited while access roads are narrow and very challenging when snowing. Rochers-de-Naye is a 2,042 m (6,611 ft) high peak with marvelous views over Montreux, Lake Geneva, and the nearby Alpine mountains. During most of the Montreux Christmas market period, Santa’s workshop (La Maison du Père Noël aux Rochers de Naye) is open for business most Wednesdays to Sundays. The MOB Golden Pass cogwheel trains from Montreux travel to the top of Rochers-de-Naye via Glion and Caux in just less than an hour. Seat reservations are essential and should be made well in advance for weekend travel. The return fares and basic admission charges from Montreux is CHF25 (CHF15 for 6 to 16) to Caux and CHF39 (CHF19 for children) to Rocher-de-Naye. The Junior Card is not valid and other general tickets require a surcharge. Special discounts are given on Thursdays during the Christmas market period in 2018. Getting to the Montreux Christmas market is easiest by public transportation. Parking in Montreux is limited and on weekends most drivers will have to park in smaller villages and special parking lots (free) near Montreux and take a shuttle bus (CHF5) to downtown Montreux. 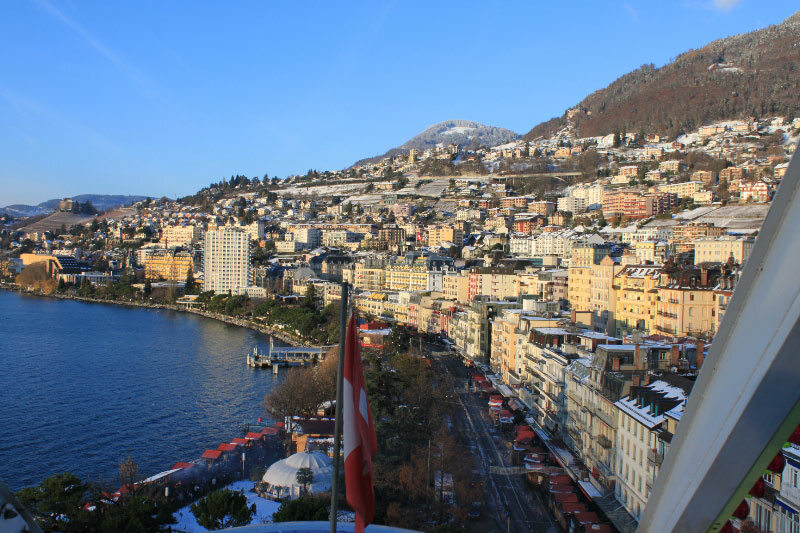 It is far easier to arrive by train in the heart of Montreux and just a flight of stairs (escalators available for the up journey) away from the Christmas market. Montreux has good train connections to other Lake Geneva towns including Lausanne, Genève, and Geneva Airport (GVA). Easy connections to Fribourg and Bern help to make the Montreux Weihnachtsmarkt popular with visitors from German speaking parts of Switzerland too. Trains are also available to the Rhone valley and ski resorts in the Alps. See Swiss Railways for online timetables and tickets. The winter boat schedule for boat cruises on Lake Geneva is very limited. Passenger ferries do not operate near Montreux, while regular cruises are limited to a few sailings on Sundays and dinner / fondue cruises from Lausanne or Genève on Thursday and Friday nights. See also Transportation to Montreux for more details on getting to Montreux by public transportation. Marchés de Noël / Christmas markets have become popular marketing tools in the Lake Geneva region (and the whole of Switzerland for that matter) in the past few years. The largest Christmas markets in the region are in Montreux, Geneva, and Lausanne but seemingly every small town a promises Christmas markets during December. Unfortunately, very few of these Christmas markets are worth going out in the cold – a few notable exceptions include the Christmas market in Coppet held early in December and the indoor Christmas market held mid-December in Morges.